In large fleets, taking quick and decisive action can get you out of a bad-start jam. 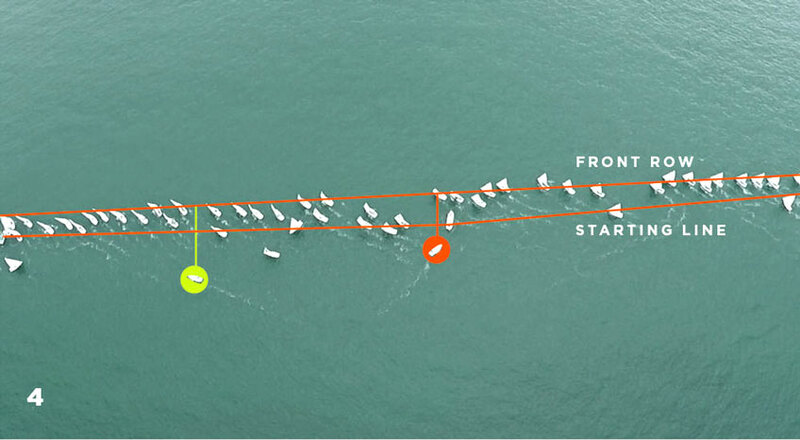 Ed Baird, former helmsman for Quantum Racing, discusses tips for getting clear in a big fleet. 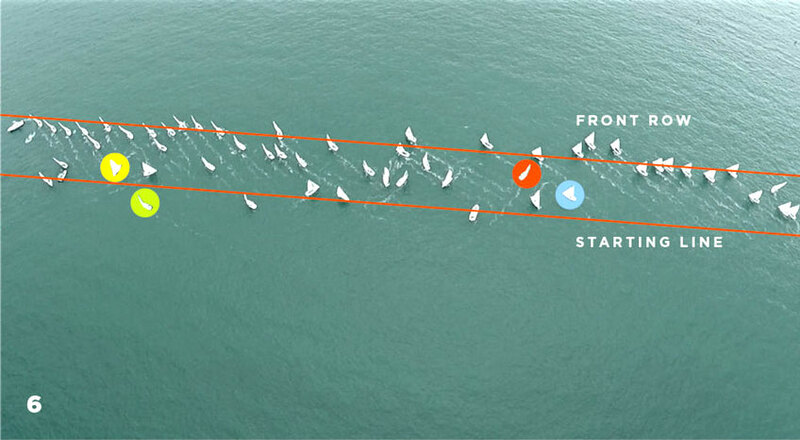 Like skiers at the top of a giant slalom run, sailors using pre-race mental imagery probably visualize launching off the starting line into a strong position against the fleet. From there, we know that playing the shifts and keeping good speed will bring success. But we don’t always envision what happens when our lane closes with 30 seconds to go, or how to recover from being late in the lineup. 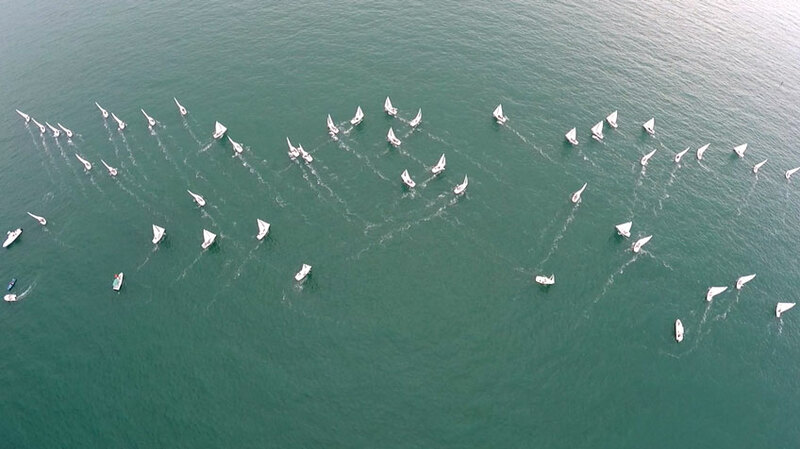 With the help of aerial pictures from photographer Keith Brash and Quantum Sails, let's look at two teams that had very different ideas of how to escape trouble in a 54-boat J/70 start. The outcome of their decisions can be a valuable lesson to all of us for any start where we find ourselves in trouble. We begin our discussion with a bit more than 30 seconds to go. Both teams are on starboard tack and beginning to realize they won’t make the front row when the starting gun sounds. They’re in the middle of the line in a steady 12-knot breeze. On board each boat, it’s time to ask, "How do we minimize the damage?" Hopefully, the helmsman will say something like: "Sorry, guys. I’ve put us in a tough place, but we can fight our way out of this. Step one, let’s get clear air." Clearly, as the fleet closes in on the last seconds of the start, our two teams seem hopelessly behind. A lot of things start to happen at this point, and the window of opportunity is quickly closing. Decisions must be made, and the correct ones can promptly put the team into the front row. Here, we're about three seconds from the start. The fleet is mostly on starboard tack. This is the time to take firm action. During the next few seconds, the teams with the best launch momentum will slide into stronger spots. Those less fortunate will struggle in their lanes. Within 30 seconds after the start, the weaker teams will look for escape routes. We need to act before that happens while there are still lanes toward clear air. Understanding how the fleet affects the wind can help us do the right thing. Generally, there's a twist to the breeze as it flows through the fleet. 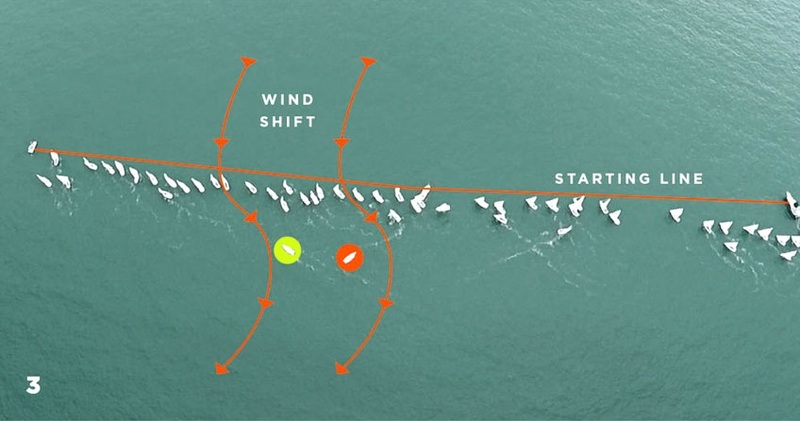 Horizontally, the wind bends through the boats and their sails to create a localized left-hand shift. After passing through the fleet, the wind eventually shifts back to its normal direction. This happens farther downwind in light air than in heavy. The size and density of the fleet can also affect how far down the shift is present. Vertically, the wind bends up and over the fleet and eventually touches down somewhere to leeward. I imagine it like a small hill or row of trees near a shoreline. Clearly, we wouldn't want to sail right up under the trees, and it’s the same for being just behind the fleet. But the wind shadow is most damaging when you’re on the same tack as the fleet. Here, starboard tackers just beyond the front row are feeling a header, along with reduced windspeed caused by the fleet. You can see by the upwind angles of our boats that starboard tack is much more painful than port. Look what's happened to our two boats a few seconds later. The starboard boat is struggling to get going because it has less wind and is in a header. From above, we can see how painful it is for the starboard-tacking team. As the front-row boats sail away, they must be thinking that it’s going to be a long race. It’s much harder to understand this from on board, but we’re a few boatlengths into the race, and already the starboard boat has lost valuable distance to the leaders. Soon the weaker of the boats in the front groups will start to tack, further blocking escape routes for the starboard tacker. Meanwhile the port-tack team is actually gaining on the fleet. The race is just a few seconds old, and already they have made substantial gains against the boat that stayed on starboard. This trend will continue until the port boat breaks free into clear air or someone tacks in front of it. 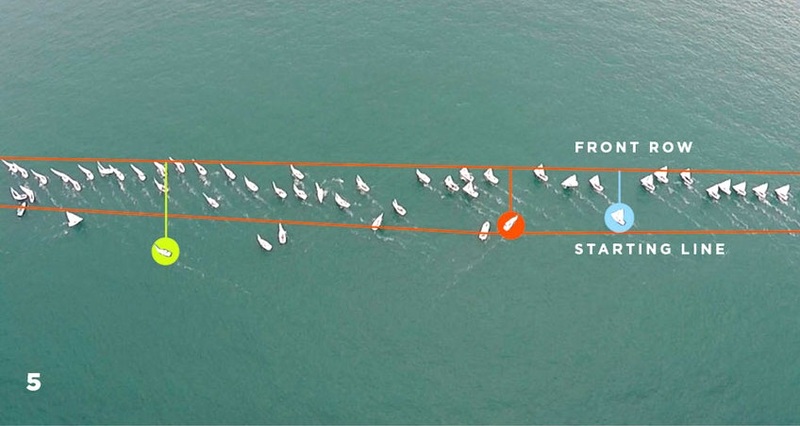 The key for teams trying to escape a bad start is to get on the opposite tack from the fleet early, before the other weak starters have time to think through their situations and do the same. Because the port-tack boat is sailing in a lift created by the fleet, it can hang with the boats near the front. It still has less wind and is clearly a few boatlengths behind, but at least it’s lifted. 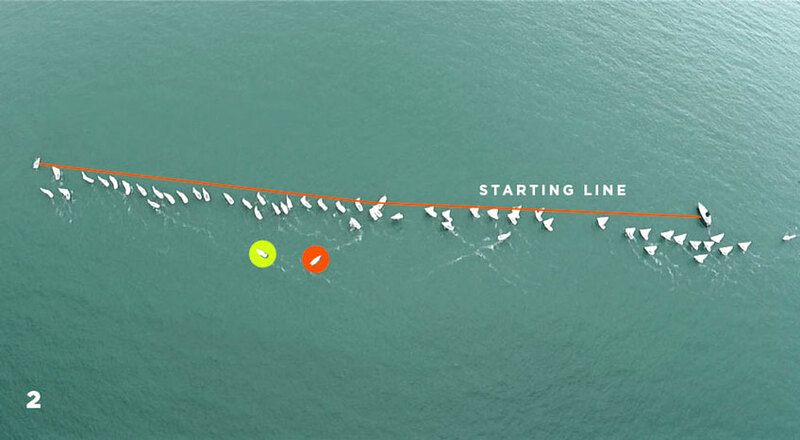 Watch as the port-tack team gains on the remainder of the fleet, which is still on starboard. The gain is partially because many of the front-row boats are pinching, trying to keep from falling into the boat ahead and to leeward. Other front-row boats are sailing a high/slow mode to dispose of the boats behind and to windward. Meanwhile the port-tack boat is free to sail a comfortable course for best speed, and is heading toward clear air on the right. The starboard-tack boat, which was originally even with the port-tack boat, hasn’t even made it to the line yet. I've highlighted in yellow one boat that is OCS. This boat bears off to return to the line and restart. Meanwhile our port-tack team (red circle) has crossed the line and is even with a starboard boat (blue circle) that’s seven lengths away. Both are at the same spot relative to the line, but just seconds later, the port boat will cross the starboard one by more than three lengths. As the clock ticks on, the OCS boat returning to the line is nearly clear yet still ahead of our starboard team. This shows how challenging it is to get moving while behind but on the same tack as the fleet. This last picture is at one minute and 30 seconds after the start. Our two teams have presented themselves with very different futures in this race. 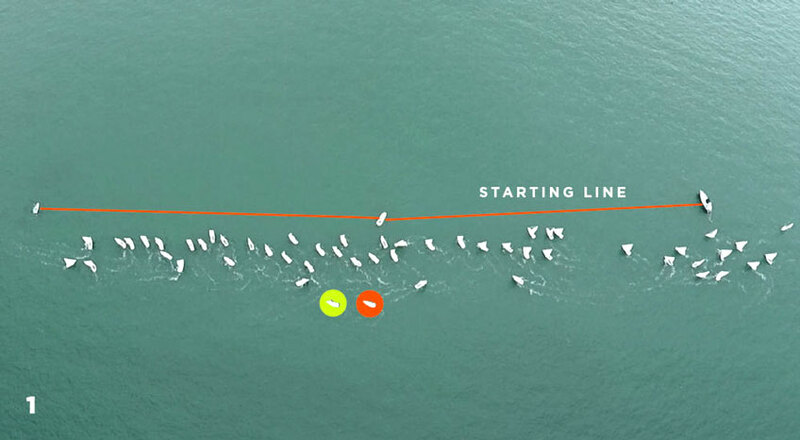 The team that tacked to port early broke through to clear air and is very near the front row of the fleet. The team that stayed on starboard for the first minute of the race is now much closer to the back of the fleet, with little opportunity to break free. Imagine their surprise when they realize the difference between each other’s scores at the end of the day. When you have a tough start, you can be behind everyone but still just a boatlength or two from the lead. It's urgent to get clear of other boats and head toward clear air to stay in the game. Usually, getting on port tack and moving across the grain of the fleet will spring you clear fastest. The longer you wait to get on port, the more likely someone will tack on you and take away your lane. If the whole fleet tacks to port, starboard tack may be your only means of escape. Port tack has its risks, namely starboard-tack boats. Sometimes you'll have to wait a few seconds for a starboard group to slow so you can tack and cross. Other times you may have to wait for that group to tack away before you can tack to port yourself. Each start and fleet is different, so look around before committing to a plan. A lot happens in the first seconds of a race. The key to your future is in deciding if you're strong enough to stay where you are or if you need to bail. Slowly losing distance to the whole fleet because you are pinching or starved for clear air usually leaves you in bad shape later. When you look bad or feel slow, get out early. Hoping things get better is not a good strategy. 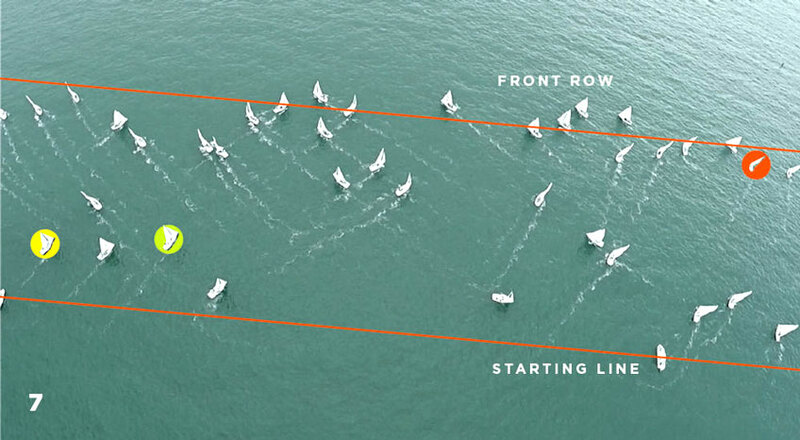 If you have more bad starts than good, consider moving up the line, toward the committee-boat (right-hand) end. If things don't go well, at least you're closer to clear air on the right side. Once you’re into clear air, get back to playing the shifts. Splitting with the fleet works when you're behind at the gun, but once you’re clear of the other boats, the fleet-induced lift will no longer exist. The bigger the shifts, the more important it is to get back into phase. Originally published in Sailing World Magazine - June 2016.